Luca performed in his end of term nativity show (a Page - dressed vaguely like a Bell Boy). Finished school until next year... and is now missing "his mates" - as he wailed tonight, in floods of tears. And the mad xmas rush of final purchases, home made presents, baking and family hoverings is all coming together... and knackering me out! So... time for some mindless, aesthetic crafting. I have always loved little wooden hangers covered in woolly, knitted or crocheted jackets. I remember my granny (Nonna) having them... and if only I'd been more interested in thrifting and granny vintage back when I was 20 (when she sadly passed away), I would've coveted all her wooden hangers, clothes, shoes, trinkets, kitchenalia, button collection, sewing machine etc... in fact, her whole house (looking back on it now) would've been a massive vintage flea market. SS into first chain, to form a circle. *CH 2 to form the first stitch. TC 10 more stitches in every chain (11 stitches total, incl CH). SS into top of first CH**. 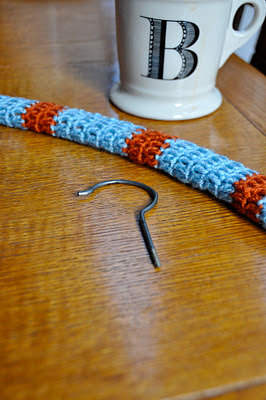 When you are finished (amount of rows depend on the length of your hanger), un-screw the metal "hook" off the wooden hanger, slide the crochet "sausage" onto the hanger, re-screw the metal hook back in it's place. Sew the ends together, with the same colour yarn (I actually left enough yarn at the beginning of the "sausage" and at the end and just used this to sew the ends in together). I suppose you could use any stitch you wanted. I used a Treble this time, but may try a Half Treble or a Double next time, to make it all a little tighter. I have also knitted some wooden hanger "jackets", which look lovely, but it takes me twice as long to knit than to crochet, so I have gone back to my Hook.